Trilobites of Black Cat Mountain is a descriptive compendium of Oklahoma's Devonian trilobites with helpful information to aid in their identification. Each species is carefully illustrated with drawings and photographs, including thorough descriptions. The writing is intended for the general reader having little or no prior background in paleontology or trilobites. However, the breadth and depth of material presented can also be appreciated by those with a technical understanding of these amazing creatures. 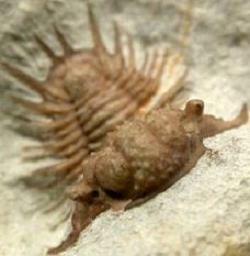 The most current scientific research on these trilobites is described in layman's terms. It is my hope that by reading this book, young emerging scientists will take an interest in these lowest Devonian trilobites and continue with their investigation and appreciation. "As an amateur fossil collector, I enjoy reading about all kinds of fossils, even those I have never had opportunity to seek. 'Trilobites of Black Cat Mountain' opened my eyes to the amazing diversity of this class of extinct animals and the environments in which they lived. I am proud to call George Hansen a friend, and have had opportunity to read some of his 'day job' work as a scientist. What made this book especially enjoyable to me was that while there were the details and esoterica required for scientific descriptions, George writes in almost a story-like manner with plenty of anecdotes. And he includes a lot of very interesting historical discussions about the study of trilobites over the last 250 years as well as giving us an informed introduction to Bob Carroll, the principal excavator and preservationist of Black Cat Mountain trilobites." The chapters are illustrated with fifty drawings, maps, charts and photographic plates in black and white. The references and bibliography include historical and recent published work on the trilobites, geology, and geography. An index of scientific names of the trilobites, special terms and the names of key investigators helps the reader to find them in the text. Now on Kindle from Amazon.com through their Kindle Store.